What would each of our staff members share if we had the chance to sit down with you one-on-one over a cup of coffee? What is God doing in our lives, and how are we personally experiencing transformation and awakening? Pour Over is a blog series by our Watershed staff members answering those questions. First up we'll hear from Taryn Hofert, Watershed Co-Founder and Co-Director of Music & Creativity. In our current series, The Fourfold Pilgrimage, we are unearthing the connection and theme of the first four books of the New Testament, known as the Gospels. In Matthew we see the theme of CHANGE, in Mark we see SUFFERING, in John (which actually flows better out of order) we see the theme of JOY and in the book of Mark we see MATURITY. As I look at this flow I can’t help but be intrigued by how the author who dealt with how we mature and develop and grow was also the same author who displayed the prominence of women in his accounts of Jesus’ life. How very interesting. Soon afterward, Jesus went to a town called Nain, and his disciples and a large crowd went along with him. As he approached the town gate, a dead person was being carried out—the only son of his mother, and she was a widow. And a large crowd from the town was with her. When the Lord saw her, his heart went out to her and he said, “Don’t cry.” Then he went up and touched the bier they were carrying him on, and the bearers stood still. He said, “Young man, I say to you, get up!”. The dead man sat up and began to talk, and Jesus gave him back to his mother. They were all filled with awe and praised God. “A great prophet has appeared among us,” they said. “God has come to help his people.” This news about Jesus spread throughout Judea and the surrounding country. In all the exhaustion and activity and buzz of the day, Jesus sees a single mom of an only child, who is a widow, mourning the death of her one and only and the text says, “his heart went out to her”. So he resurrects her son and the people who saw were filled with awe. The scene ends with THIS NEWS ABOUT JESUS SPREADING. Next Jesus is having dinner at a Pharisee’s house and a woman considered “sinful” by her city hears that Jesus is there and shows up in the middle of the meal with a jar of her best and most expensive perfume. She proceeds to wash his feet at the dinner table with her tears mingled with a jar of her most precious perfume and kisses his feet and dries them with her hair. She’s touching him, and crying on Him and covering him in a womanly scent and when the host objects, again Jesus reminds those at the table that none of them have showed him this kind of uninhibited, beautiful, humble love and he sees her and loves her. I can only imagine some gasps were heard around that dinner table. The Twelve (His disciples) were with him, and also some women who had been cured of evil spirits and diseases: Mary (called Magdalene) from whom seven demons had come out; Joanna the wife of Chuza, the manager of Herod’s household; Susanna; and many others. IT WAS NO LONGER A BOYS' CLUB. Jesus had a woman posse now and they were on making stops at villages and towns and cities near you and the news was spreading like wildfire. And not just any women: formerly possessed women, important women, formerly sick women, women named Susanna, everyday women… all kinds of women were now part of the traveling Good News. Like an ancient Middle Eastern Ghostbusters Gal Team meets Golden Girls kind of posse. I bet that news BEGAN. TO. SPREAD. Yet, Jesus stops in the middle of it and notices that someone had touched Him (I’m sure lots of people had touched him in the crushing crowd). But this touch was the kind that Jesus said caused power to go out from Him. And who had done it? TWELVE, as in twelve disciples who were the men noted for helping Jesus carry the good news... but they weren’t the only ones. The word was on the street. The news about about the single mom losing her only child. The sinful perfumed foot washer. The formerly possessed and diseased and rag-tag female Jesus posse tribe. SHE knew if she could just get close, close enough to the good news that God in human form CARES ABOUT WOMEN AND HOW THEY SUFFER, then maybe healing could be hers as well. Maybe this news was for her too. Then, yes, he headed onto Jairus’ house and was too late, but it didn’t matter, He brought that daughter back to life. MAKING WOMEN WHOLE AGAIN WAS HIS KIND OF THING. The GOOD NEWS is much more than heaven and hell talk, which sadly might be what you were told. THE GOOD NEWS is Jesus doused in perfume, hitting the road with a rag tag group of lady folk and turning things upside down in the best possible way. THE GOOD NEWS, in case you missed it or no one told you, is that the very eyes of God see you in your mourning or your singleness or loss or brokenness or situation and the very heart of God is WITH AND FOR YOU. Stretchmarks and cellulite, single and married, old and young. Perhaps even adored in a more tender, compassionate way. So, as a middle-aged girl who has been a bit worn down by my many years in church leadership, I want to remind you that Watershed is the first church community in my life where I felt this GOOD NEWS reverberate. Where my close friend Rachael has been part of our leadership (aka deacon) team since day one. Where women speak and teach and preach with regularity on our stage. Where single moms are abundant and where the child-bearing, adoptive, childless and everyone in between are continually reminded that YOU MATTER HERE. 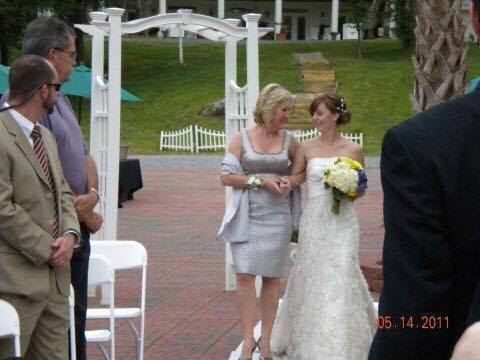 My husband did the wedding of a beloved Watershed couple, Jesse and Brian, a few years ago here in Charlotte. I remember watching Jesse being walked down the aisle by her single mom who raised her so beautifully and just feeling God all over it. God has been WITH AND FOR THEM all along. I saw really good and gorgeous news walking that aisle. So I leave you with a blessing that I wrote for the women of our community a few weeks ago. I’m thankful for a church where we can take time out on a Sunday morning to even do something like this. I invite you to say it over your daughters and your sisters and your mothers and grandmothers and aunts and friends. In the wake of all the news/drama of our election and in all the ways that we as the Church have missed opportunities to represent the real GOOD NEWS, maybe this rest on your estrogen-fueled souls. I often need this reminder too, girlfriends. AND THE NEXT TIME YOU PUMP A FEW SPRAYS OF PERFUME, BE REMINDED THAT JESUS SMELLS LIKE YOU AND HE WEARS IT PROUDLY. Read more from Taryn on her blog: www.the8ths.com.